This Fully-Loaded Brownies recipe is packed full of chocolate + cheesecake goodness and then topped with candy, nuts and other deliciousness. If you haven’t tried loaded brownies, what are you waiting for? You can use any GF flour blend you choose but I like Pamela’s GF Artisan Blend in this recipe (and most others). One of the best things about this Fully-Loaded Brownies recipe is that it’s totally customizable! Try it with your favorite chocolate bars and don’t be afraid mix up the nuts! I love pistachios on loaded brownies, but walnuts and pecans are always fabulous too. The sky’s the limit – and I’d love to hear about your creations! Let me know what combinations are your favorites…I’m always looking for inspiration! P.S. – it’s possible we dug into these with forks at my last Whole Foods Market cooking class. Preheat oven to 350°. Lightly spray 8 x 8 inch square pan with cooking spray. Make the Cheesecake Layer: In a medium bowl and using an electric mixer at medium speed, beat the cream cheese until smooth and creamy, about 1 minute. Beat in the sugar and the vanilla until very smooth, 1 to 2 minutes. Beat in the egg until well blended. Set aside. For the Brownies: In a small bowl combine flour, salt, baking powder, and cocoa. Mix and set aside. In a large bowl, whisk oil and eggs together until combined. Add vanilla and sugar. Slowly mix in flour mixture and water. Once all flour is combined, reserve 1/2 cup of brownie batter and spread the rest spread evenly into the prepared pan. Pour the cheesecake batter over the top of the brownie batter and smooth. Drop the reserved brownie batter in large dollops over the topping. Draw the handle of a wooden spoon through the two batters to create a swirled effect. Top with chopped candy and nuts, and gently push down to slightly sink topping into batter. Bake on center rack for 40-45 minutes or until toothpick comes out with just a few crumbs. 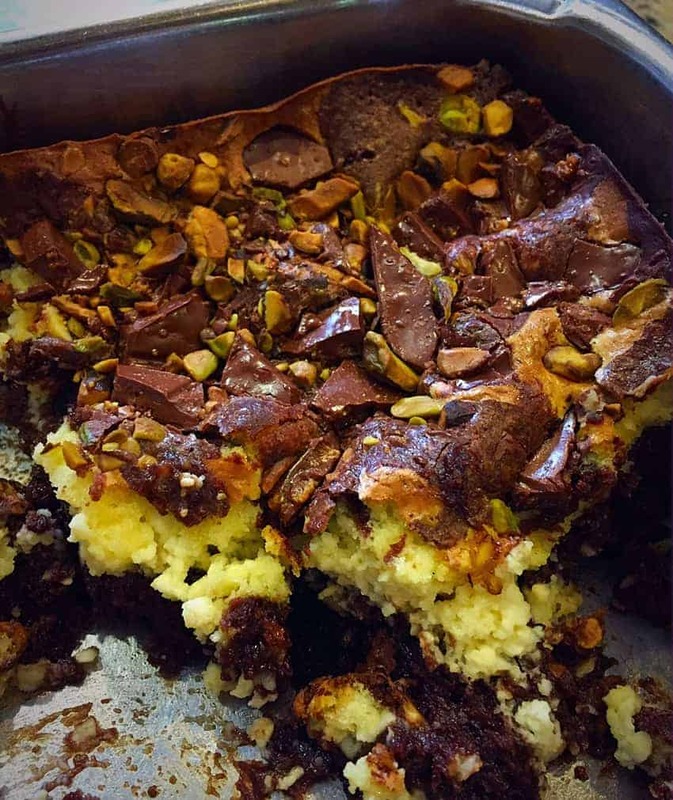 This entry was posted in Baked Goods, Desserts, Recipes and tagged cheesecake brownies, G-Free Foodie, gluten free, gluten free baking, gluten free brownies, gluten free dessert, gluten free loaded brownies, kc cornwell, loaded brownies. Bookmark the permalink.